→Krown longboards – The king of entry level longboards? 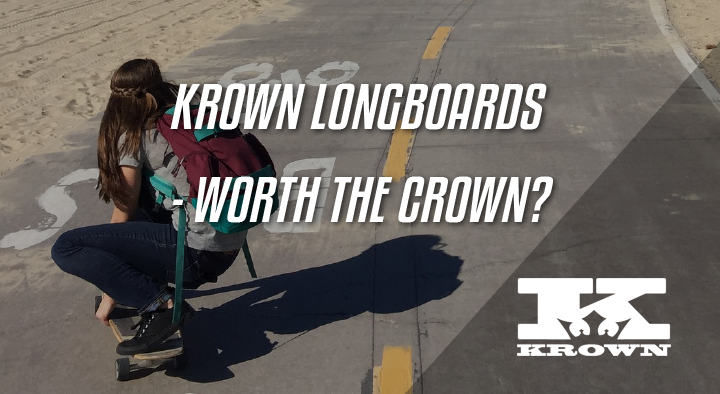 Krown longboards – The king of entry level longboards? 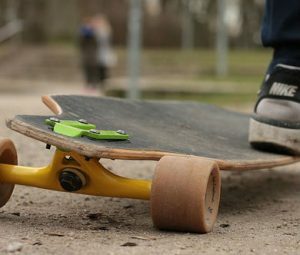 Got that itch to longboard but don’t know where to start? Check out Krown skateboards. Krown skateboards have been in the scene since 1996. They have made a place for themselves on the beginner longboard market and are a well known brand. They are good at making effective low cost boards. Perfect for those just starting out. This is the classic Krown pintail longboard. The boards comes in at a HUGE 46in in length and 9in in width. At this length, the deck naturally flexes. It has the skinnier black wheels at 71mm and 78a hardness.. 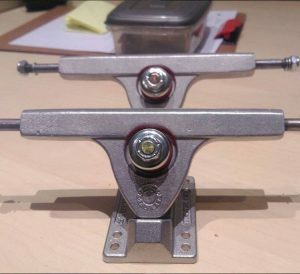 The trucks are traditional kingpins with risers to prevent wheelbite. I recommend loosening the trucks for easier turning. At this size the deck will be slow to turn, but will be alot more stable than the other options. Heavier riders have said that the board works great for them. I feel like with this board, if you like it go for it. But to be clear its not for everyone. It won’t be easy to get around on this thing, so its limited to cruising. But it excels at it. This is my favourite board from the Krown line up. The Krown Rasta Lion! This is a drop through board at 9.25in wide and 36in long. It features the standard Krown wheels and reverse kingpin trucks at 7in. The deck itself is made from 9plys of canadian maple. It will be strong and stiff (but also heavy). The graphic is a lion in the famous rasta colours. This is a great beginner board, stable and easy to push and footbreak on. With its length, its a pretty short longboard, but this makes it turn faster and weigh less. With this board you can do any longboard style you want. Its an all round great board. If you are undecided, this is my recommendation to you. This Krown exotic longboard features beautiful exposed bamboo, with a gorgeous bamboo leaf graphic on the top and bottom. The board its self is 9.25in and 41 in long and has a hybrid bamboo/maple construction. It also has a bit of flex. It also features the standard Krown wheels and traditional kingpin trucks. This setup is comfortable to ride and rides really smoothly. Though it might require a bit of a break in period. Because of the length, you might find that it doesn’t turn very quickly. It is otherwise a good beginner board. The deck alone makes it worth the price and the other things can be replaced if you are unsatisfied. You can use this board for cruising and dancing. Krown make a lot of longboards. However they specialise in HUGE pintails and have quite the variety. No other longboard brand has many pintails as they do. This is where they set themselves apart. Their other boards are quite good as well and have various styles for everyone. The most important thing with a beginner brand is getting a deck you like. For the price points most of these setups will come with okay-ish trucks (the wheels don’t matter too much). The deck is where you get the real value. You can always upgrade your trucks (and wheels) if you need to in the future. Krown makes quality decks. They have quite the variety and you can definitely find the one you like from their line up. Their decks are mostly made from hardwood maple which is a popular material for making decks. They have some decks made from bamboo as well. Either material will hold up well and can take a bit of abuse. Some of their decks are flexible, which is great for cruiser boards as it absorbs shock from imperfections in the road. They make use of either clear or black griptape. It doesn’t make a difference which they use. Though the clear grip is used to expose the wood or a design used beneath. Krown make either top mounts or drop throughs. The difference is how the truck is mounted. Drop throughs are more stable and easier to push than top mounts, but they are not as maneuverable and don’t turn as sharply. They make decks in varying lengths. Typically the longer it is, the more stable it will be but it won’t turn to well. If you want to commute, then get the shorter longboards. For an easier time cruising, the long ones will do. This is perhaps the main weakness of the setups from Krown. Their boards either use traditional or reverse kingpin trucks. The reverse kingpin trucks are more stable and turn better than the traditional ones. This is only noticeable if you want to take tight turns as you cruise. Otherwise either will do the job. The trucks Krown uses come in varying lengths. The shorter a truck is the more maneuverable it will be, and the wider it is the more stable. With practice, truck length becomes less significant to stability. The boards that come with tkp trucks come with risers to prevent wheelbite. Even though I have said they are the weak link, the trucks Krown longboards use are still pretty good for beginners. However if you are gonna upgrade, they should be the second thing replaced after the bearings. Krown uses some standard wheels across a few setups. They are either white color or black. 78a durometer which means they are soft and good for absorbing road vibration for a comfortable ride. 71mm. A great height for cruising makes it easy to roll over any road imperfections and pebbles. If you are feeling brave, you could probably ride in the dirt. The white wheels are more suited to cruising and will also grip the road well. No fear of slipping out when doing tight carving. The black ones are used on their pintails. These are skinnier and are more suited towards cruising and light carving. They don’t grip as well but are slightly easier to push due to being lighter. Krown use various bearings in their wheels. Even though they give them different names, they are probably all the same. They require a bit of a break-in period, but even then they won’t work the best. We recommend replacing them when you get the opportunity. This small upgrade will make it easier to push and cruise. The most important thing in skateboarding is starting to skate. Other things are mostly details and it seems Krown understands this. They are probably one of the best beginner brands. Beginners should pay close attention to our guide and understand the weaknesses of these longboards. Out of those we have reviewed, I personally recommend the Krown Rasta longboard. Don’t let our recommendations hinder you. Skateboarding is a very personal thing and if you feel strongly for a board go for it!